The other day, I went to Costco for shellfish – I needed it for a recipe. But they only sell large bags of mussels and clams, as you know. They looked so good though, that I couldn’t resist. So I had more than plenty for what I needed it originally for, and a new dilemma what to do with the rest. Simple solution – I just steamed them! It took just a few minutes and we had a wonderful, light a super tasty dinner for hot summer night! (Light it was meant to be, but we stuffed ourselves anyway!) If you are on low carb diet, you have got to skip a day. Crusty bread to dip into this delicious broth, is a must! 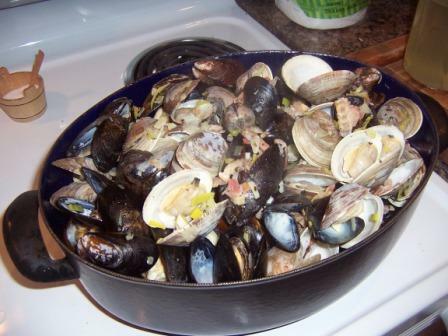 Simple and fast dinner recipe – I don’t think you can go wrong with a fresh shellfish! 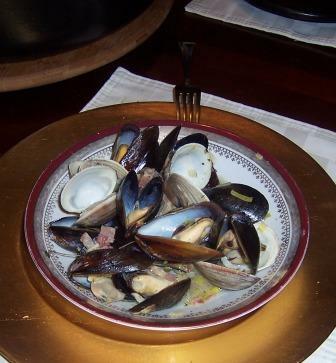 Scrub clams or mussels well under running water; pull any beards off mussels. Discard open shellfish that don’t close when tapped. In the meantime heat a little bit of olive oil in a large pan (so all the shellfish would fit in and could be covered). Saute chopped bacon, onion, garlic and leeks for a few minutes – until soft. Add chicken broth and bring to boil. Add shellfish to boiling broth and sprinkle with wine. Cover and cook until shells pop open, about five minutes. Spoon into plates, sprinkle with parsley and serve immediately. You can serve wedges of lemon on the side, if you desire (but we didn’t need them). I have picked an excellent white wine from French Loire, Domaine de la Pépière Muscadet Sèvre et Maine sur Lie to pair with this dish. It was crisp, lemony and refreshing, just like this casserole full of goodies. 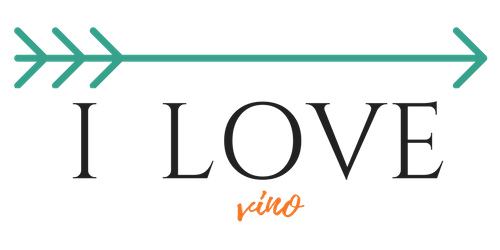 We ate way more than we needed – and drank the whole bottle. Yeah, it was pretty good idea, this dinner!